NYSE-listed outsourcing firm Genpact Ltd has announced the acquisition of California-based cloud computing firm Akritiv Technologies. The size and terms of the deal were not disclosed. It comes close on the heels of Microsoft Corporation saying it will invest 90 per cent of its R&D budget on cloud computing this year. Cloud computing or Software as a Service (SaaS) allows users to access business applications over the Internet through their browsers and differs from the traditional software package model where enterprises had to buy applications and install them on their servers and computers. Akritiv offers a suite of order-to-cash solutions, delivered on Salesforce's Force.com platform. The SaaS-based solutions improve accounts receivables collections, optimise the company's credit risk and also offers analytics. The suite consists of modules for risk and credit management, collections productivity, customer management, sales & dispute collaboration, management reporting and cash forecasting. In 2009, the company acquired eBilling solutions from Avolent. It also offers back-end analytics to make the sales process more efficient. "Akritiv Technologies' innovation, technology acumen and commitment to providing OTC solutions are an ideal fit to our previously announced BPaaS strategy," said Tiger Tyagarajan, COO of Genpact. "We are aggressively expanding our technology and BPaaS capabilities. We will offer cloud-based OTC solutions to our clients to help them mitigate risk, enhance workflow and perfect their reporting processes in a cost-effective manner." Akritiv's order to cash solution is used by corporate credit and collections teams, financial controllers, treasurers, executive management and sales management teams. The solutions will continue to be sold directly to companies and will also be sold as business process as a service (BPaaS) bundled with Genpact's existing OTC portfolio of services. Genpact claims it has the largest business-to-business OTC operation in the industry, with associates around the globe managing more than $100 billion in revenues for clients for the entire customer-to-cash lifecycle. 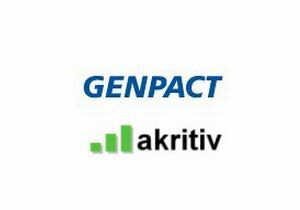 "Genpact's strong market position and deep domain expertise in OTC best practices, as well as a global operational footprint, provides Akritiv and its customers the strength and market positioning to take our solutions to the highest levels in the industry," said Sanjay Srivastava, president and CEO, Akritiv Technologies. Genpact recently announced its intent to acquire IT consulting firm Headstrong Corporation for $550 million. The acquisition will help the company target capital markets and healthcare segments with its governance, risk, compliance and back-office processing services. In February, 2010, Genpact acquired Symphony Marketing Solutions, Inc., which provides analytics and data management services to the retail, pharmaceutical and consumer packaged goods industries. Soon after, Genpact Mortgage Services made an equity investment in High Performance Partners, LLC (HPP), a technology solutions developer for the mortgage industry. Amazon, Salesforce, SAP and Oracle are the top cloud computing service providers for enterprises in India. Other cloud computing solution providers in the country include Chennai-based OrangeScape, which has a PaaS (Platform as a Service); Wipro's w-SaaS, which enables quick SaaS deployment; Netmagic, which offers Infrastructure as a service; Reliance's hosted infrastructure service; Tata Consultancy Services' ITaaS framework, which targets manufacturing, retail, healthcare, education and professional services and Infosys' solution aimed at the automotive industry.